Pycnosorus thompsonianus (Asteraceae) is an Australian native annual with green to silver grey narrow leaves. It has small bright yellow egg-shaped flowerheads with erect peduncles. Pycnosorus normally flowers in spring and summer. Pycnosorus thompsonianus occurs in semi-arid areas and often flowers on mass on floodplains after winter rainfall. Daylength and temperature have been reported to affect floral initiation and flower development of some of the species of Asteraceae family. Helichrysum bracteatum (Sharman and Sedgley, 1988) and Helipterum roseum (Sharman et al 1989) respond to long days, Lawrencella davenportii and L. rosea respond to short days (Bunker, 1995), whereas Brachycome halophila is day neutral (Bunker, 1995). In addition, some species show a reduction in the time to flower following vernalisation treatment . The temperature requirement for vernalisation may vary depending on species, e.g. 15°C in Cineraria (Yeh et al 1997), 12°C in Osteospermum jucundum(Pearson et al 1995), and less than 7°C in strawberry (Rariden and Shaw, 1993). Long days have been reported to replace the vernalisation requirement of some species, including Brunonia (Cave et al 2010). The environmental control of flowering of Pycnosorus, particularly the effect of daylength and temperature regimes are reported in this study. Pycnosorus seeds were treated with GA3 (50 mg L-1) for 24 h prior to sowing. Two experiments were conducted. In the first experiment plants 35-day-old plants (maintained at 30/20°C SD) were cooled at 20/10°C or 30/20°C for 3 or 6 weeks under short day (SD), long day (LD) or short day for six weeks before transferring to long day (SDLD). In the second experiment the 35-day-old plants (maintained at 30/20°C SD) were maintained under 20/10°C under SDs for 6 weeks prior to transfers to a different research greenhouse bays for daylength and temperature treatments, i.e. 20/10 and 30/20°C (day/night, 11 h cycle, 6am-5pm) with either continuous SDs or transferred to LDs after 6 weeks under SDs. The SD was 11 hours of sunlight from 6:00- 17:00 at which time the blackout curtain in each bay was closed. The LD was 16 hours (11 hours sunlight + 5 hours incandescent light at 21:00-2:00 h). Reproductive growth in LDs commenced earlier than in SDs or SDLDs, i.e. when the plants had 5-9 branches. Almost 100% of the plants under LDs had formed visible buds after 11 weeks. In contrast, under short days 70-90% of the plants remained vegetative at week11; it was not until week 14 and thereafter that initiation was observed (data are still being collected). Plants under SDs had 17-21 branches when they reached the visible bud stage. Plants under SDLDs treatment showed enhanced flowering after transferred to LDs, suggesting the importance of LDs for flowering in this species. Plants under LDs flowered regardless of temperature regimes. Under SD, more plants flowered when previously exposed to cool (20/10°C) compared to warm temperatures (30/20°C) (Data is still being collected). Results from the second experiment confirmed the importance of LD for Pycnosorusflowering. Plants under LDs reached visible bud stage earlier, i.e. 88 days after planting compared to >93 days under short days (data is still being collected). More than 50% of the plants under LDs had formed visible buds at week 13. In contrast, under SDs 70-90% of the plants remained vegetative at week 13 (data still being collected). Plants transferred to LDs produced a greater number of inflorescences at week 14 than plants kept continuously under SD. In addition, a greater number of inflorescences were produced at 30/20°C than at 20/10°C at week 14. Data on the effect of temperatures in SD are still being collected since most SD plants have not reached the visible bud stages. 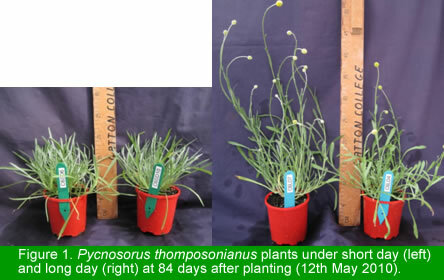 Plants grown under long days were more elongated than those grown under short days (Fig 1). Seeds of Pycnosorus were collected on 14/09/2003 from Wallen Station, South West Queensland from from a very large population over several hectares. Only mature seeds close to the point of natural dispersal were collected. However, at least four phenotypes with two different colours of leaves (green and silvery green) and differing leaf width were observed among the plants (Fig 2).